It’s a challenge to choose where to start when writing about KFC in China – the largest restaurant chain in the largest country in the world. It’s a company that has completely re-invented itself in recent years, from operating a single store in 1987 at the Great Wall of China, it has grown to now more than 5,000 stores, and it shows no sign of slowing down. As loyalty specialists focused on acquiring and engaging customers, we can’t help but be impressed by their numbers. In their first year alone, over 80 million people signed up to their ‘Super App’ and just three years later, the brand now boasts in excess of 120 million members. What’s even more impressive – and may also be the reason for its dramatic success, is the fact that the app has been designed not just for customer recognition and rewards – but also to transform every customer connection point possible – enabling orders, payments, deliveries and e-gifts in one seamless digital solution. Such dramatic transformation was driven by the needs of China’s youth population, a market of over 225 million people who simply weren’t connecting with the chain in recent years. In market research, millennials described the brand as a “middle-aged businessman in a middle-age crisis” – prompting dramatic decisions and a digital transformation project that has truly re-invented their entire business. With such a clear mandate for change, the company chose to self-disrupt rather than be disrupted, creating industry-leading experiences that have transformed the business both operationally and commercially. The KFC China Super App with over 120 million members. As a global brand, KFC clearly has brand guidelines to comply with. Their traditional quick service restaurant characteristics from the USA included a commitment to sell food that is “delicious, safe, high quality and fast” however KFC China decided to think beyond those basic values, adding “nutritional balance, healthy, local relevance and unlimited innovation” as essential success factors for themselves. 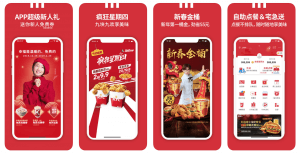 With the impact of these localised brand values now driving real value for customers and stakeholders, here are our favourite examples of how KFC China has innovated and excelled, and nowhere is the strategy more evident than on the home pages of the brand’s websites in the USA compared to China. As well as online orders and payments, KFC China uses the app to send exclusive offers and coupons to its loyalty base. These are focused on driving business on off-peak days such as Tuesdays, and running promotions for key events such as the chain’s 30th anniversary when members could buy products at the original price from 1987. The app also offers rewards when you first download it with a rich cash value of 88 yuan (approx $13) and packages such as five breakfasts for 39 yuan (approx $6). KFC China identified the country’s 564 million gamers as a great market to target, leveraging their youth, scale and passion as a way to completely re-position their brand. 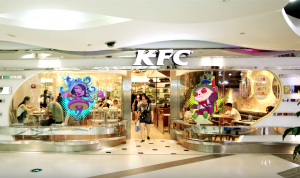 Rather than developing games of their own, they instead chose to partner with the country’s award-winning gaming giant Onmyoji to create an exclusive KFC China game. Drawing comparisons to Pokémon Go, this game uses location-based services and augmented reality to encourage players to meet in-store to play together. The brand presented the case study at the prestigious Cannes Lions Festival, quoting extra-ordinary results, including three million Onmyoji meal boxes which sold out in nine days – a KFC record! A button to order your KFC food from within the game itself. A ‘gamer’ menu focused on food that can be eaten with one hand. Themed restaurants that featured “League of Legends” experiences and branding. 5% overall increase in customers (highly significant on top of a large customer base). 35% uplift in sales in themed stores. A League of Legends themed restaurant in China. In an interesting move to maximise their digital distribution channels, KFC China has opened a digital store on TMall – the Chinese language consumer eCommerce marketplace operated by Alibaba, which is the world’s ninth most visited website. The brand is tapping in to the traffic to firstly register members to its loyalty app, and also to sell gift cards and coupons – described as their way to “build a new O2O [online-to-offline] model” – using digital techniques to drive store visits. And the results were “beyond….expectations” with KFC’s parent company Yum China announcing sales of over 80,000 chicken nugget packs on launch day alone. Music content is a perfect fit for millennials and KFC China has built an innovative platform where customers can choose and play their chosen tunes in-store. Watch the video below to experience the concept of a digital juke box. It also showcases their partnership with smartphone manufacturer Huawei, with whom they launched a limited edition smartphone in 2017 to celebrate the brands thirty year anniversary in the country. The hardware partnership featured the fast food company’s iconic founder in a truly innovative handset design, with production limited to just 5,000 units. Charging stations for mobile phones. The ability to order from the personal digital assistant – Dumi – the world’s first AI service robot in the fast food industry, which uses artificial intelligence to understand local dialects, profiles and even moods. See the video below to see this in action. Even paying is painless. In 2017, KFC China partnered with Alipay to launch Smile to pay – the first commercial application of facial recognition payment technology globally. After positive customer feedback, the facility has now been extended to 300 KFC stores nationwide. Watch the DUMI service robot developed by KFC China. In closing, it seems KFC China is cleverly using customer data to invent completely new dining concepts. A key reason for any loyalty programme is to segment and profile customer behaviour and develop strategies to drive increased frequency or spend, and in this example, this has resulted in re-inventing the core product. The KFC Super App is driving “unprecedented insight into consumer behavior”, which was likely instrumental in the development of their entirely new restaurant brand called KPro which has opened in Hangzhou, Beijing and Shanghai. The KPro concept doesn’t sell the iconic fried chicken of its sister company – instead it offers a juice bar and salad bar that cater to consumer demand for healthier options and better dining experiences. It is also a digitally-enabled restaurant, offering digital (or traditional) food ordering options, the ability to ‘smile to pay’, all supported by quality cutlery and table service. With so much dramatic change already achieved, it’s hard to imagine what’s next. KFC China is an incredibly inspiring case study how in just three short years, the business has transformed itself from a fried chicken store in to a powerful tech brand with its eyes focused firmly on the future. 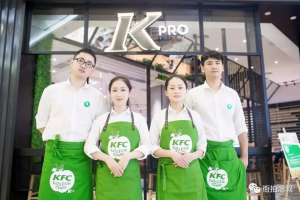 The branding for KPro – KFC Going Green in China.